My staple light protein conditioner is Miss Key 10 en 1, but I have to admit I've never been crazy about the smell. It has this weird mango/peach smell, which in theory sounds like it would smell great but it just doesn't seem to work for me. Although it works very well, especially with heat, it would also be good to find another reasonable alternative in case I can't find the Miss Key conditioner. 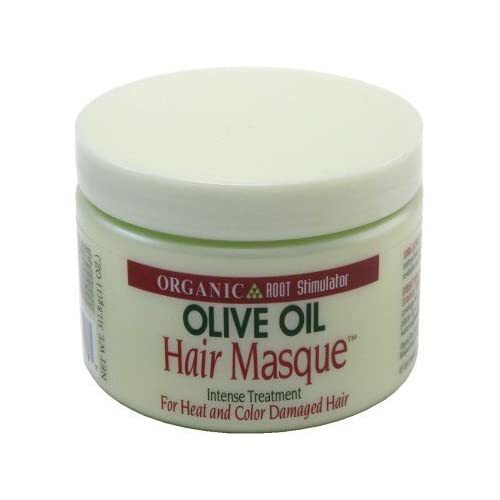 After browsing Hairlista for a while and reading a bunch of reviews, I chose to try the new Olive Oil Hair Masque from ORS. From what I researched prior to purchase/use, it was advertised as a (more) moisturizing deep conditioner, that had great slip, clean scent and was light on silicone. I've used the Hair Masque a few times, deep in a stretch, right after a relaxer and for use prior to relaxing to strengthen my hair. In all of these situations, this product has done what it was supposed to. It has detangled, smoothed, strengthened and left a fresh scent that has persisted for days. For my hair though, this was not a moisturizing deep conditioner, this was def a light protein as it contains hydrolyzed keratin. My hair rarely interprets protein containing conditioners to be moisturizing, with the exception of Nexxus Humectress (but only the one in the bottle). The ORS Hair Masque really does a flawless job of strengthening without making the hair hard, tangled and unmanageable. I'd say this product is safe to use weekly, especially if you chemically process your hair. I highly recommend this product, unless you are sensitive to fragrance or protein. My skin is a bit sensitive to fragrance though, and due to the intensity of the fragrance I will keep an eye on my scalp's reaction and update that later on if necessary ;). Claims: An intense treatment conditioner that helps restore heat and color damaged hair. Infused with natural and other ingredients, this hair masque will revitalize and detangle the hair leaving it soft, shiny and smooth. How do you feel about the ORS Hair Masque?